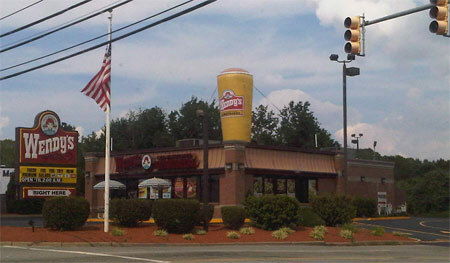 There was another Wendy's about 2 miles down the road with the same giant frosty. I think the only thing really missing is a giant spoon sticking out. I guess summer is grasshopper season in more ways than one. I saw Blue Bunny's "NEW" Grasshopper Ice Cream Sandwiches at Walmart the other day. I emphasize NEW because the box I saw said new, but the website box obviously does not. I also saw Breyers Limited Edition Grasshopper Pie ice cream at Walmart. It was their usual all natural style in a black container. I believe the exact description was mint ice cream with a fudge swirl (as opposed to the typical chocolaty chips). I could have picked up either product, but to be honest, I'm just not in a minty mood. 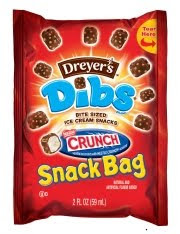 Greg's video review of Edy's Dibs reminded me of my own snack pack of Dibs hiding in the deep freezer... While I do detect a potentially tasty nestle crunch ice cream bar vibe, they hid just a bit too long in the freezer and they didn't taste quite right. No worries though. Since he gave such a glowing review, I will have to sample some fresh ones for myself in the very near future. Yummm chocolate frosty in the summer...the best. Although it is refreshing you can only do so much mint.